Ballymore Stables lost a great servant during the week with the retirement of Rhythm To Spare. 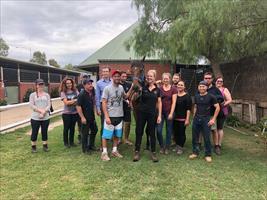 Rhythm To Spare missed his intended last start due to a cut on his hock but has made a good recovery from his injury and he left our stables for his new life last Sunday. He has gone to a young lady who our vet Emma Wood knows well and attends to her other horses for a new life as a show horse. “Rhythm was a real favourite of the stable and he was a terrific horse for his owners,” Mike Moroney said. desperately unlucky in the 2014 Toorak Handicap behind Trust In A Gust but that’s racing and he gave a lot of people a lot of pleasure. “He was training as if he was a two-year-old even in this preparation but we had said at the start it would be his last hurrah and we certainly did not want to risk him going one last time. A son of Pins, Rhythm To Spare was purchased as a yearling for $100,000 by Paul Moroney from the draft of Pencarrow Stud at the 2011 New Zealand Bloodstock Premier Sale. He retired sound with 11 wins and 10 placings from 57 starts and earnings of $815,009.